However, DJI Mavic Pro records 4K video in MP4 or MOV with MPEG-4 AVC / H.264 codec, which is not a native editing codec for most NLEs including iMovie. So if you try to import and edit DJI Mavic Pro 4K footage into iMovie, you're likely to run across various issues: screen freezes, program crashes, no audio, etc. So how to solve that? Read on to get the solution. Generally the common personal computer doesn’t have the ability to process the DJI Mavic Pro 4K video editing work, even if you can import DJI Mavic Pro 4K footage into iMovie on Mac. The quality of DJI Mavic Pro 4K videos is ultra high definition, so it requires very powerful computer hardware for smoothly editing. In short, for the purpose of better and smoother editing, you're advised to compress DJI Mavic Pro 4K to 1080p. The H.264 codec is not good for video editing as we mentioned above. Even with high computer Configuration with a hard disk array, you will encounter performance issues if your source 4K video is in H.264 codec. AIC is the most compatible format for iMovie. With the help of Pavtube HD Video Converter for Mac, you can easily achieve the goal. With the professional 4K video converter, you can effortlessly encode DJI Mavic Pro 4K MP4/MOV footage for smoothly importing and editing in various non-linear editing systems (NLEs), including iMovie, Adobe Premiere Pro, Avid Media Composer/DaVinci Resolve, Final Cut Pro, Premiere Pro and more. Besides, DJI Mavic Pro clips, it also can deal with other video formats such as H.265, MKV, MTS, MXF, XAVC, FLV .etc on Mac OS X including macOS Sierra, El Capitan Yosemite, Mavericks, Lion. Now, download the software on computer and follow the guide below to start conversion. Launch the iMovie Converter and click "Add video" button to locate the .DJI Mavic Pro 4K file(s) you want to add. Check the "Merge into one file" box, you can join several DJI Mavic Pro 4K clips together if necessary. 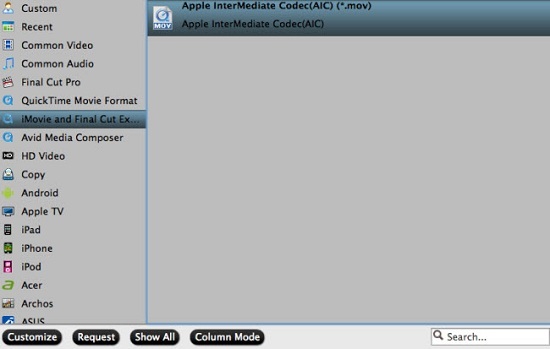 Click "Format" pull down list to select iMovie and Final Cut Express > Apple InterMediate Codec(AIC) (*.mov) as the best video format for iMovie (11). Click "Settings" to fix the frame rate, bitrate, video size, etc to your needs. To have a smooth editing with iMovie, you need create the files with the appropriate resolution and frame rate that matches your source footage. Click "Convert" button at the bottom right corner to finish endocing DJI Mavic Pro 4K mov/mp4 to AIC .mov for iMovie (11) on Mac OS X. After the conversion, click "Open" to locate the encoded videos and then launch iMovie, choose File > Import > Movies..., to import the converted video into iMovie; prepare for editing. You will find that it's just a piece of cake to edit DJI Mavic Pro 4K files in iMovie (11). YouTube Support 4k files from DJI Phantom 3 (Standard/Advanced/Professional)? How to Play MKV on Wii without any problems?